Professional's event editor can edit local events within Professional's Event Library, and remote events residing on Macs across the network. 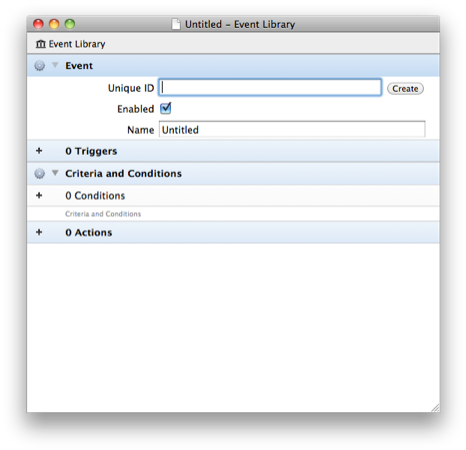 To being using the event editor, double-click on any event. The editor is divided into major and minor sections. The major sections are separated by blue bars. These major sections represent the major sections of the event: the triggers, criteria and conditions, and the actions. Power Manager supports default and optional fields. This advanced behaviour means you only need to complete the fields that are unique to your event. Most fields have defaults. Leaving the field empty will result in the default value being used. Optional field are those fields where no value has a meaning. Often that meaning translates to that field's behaviour is not desirable. The action sleep action has an optional duration field. If no value is provided, then the Mac will sleep until manually woken. Alternatively, if a duration value is provided, the Mac will sleep for that duration. 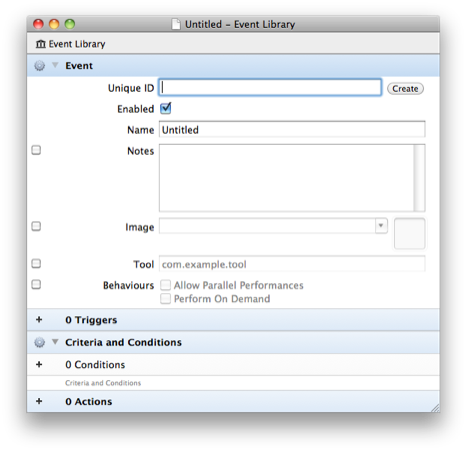 Default and optional fields dramatically reduce the complexity of an event. To view the optional fields of a particular section, use the Action (cog) menu and toggle Optional Fields. At the top of the event editor is the event's settings. These fields include the presentation information, such as the event name and notes fields. The Triggers, Criteria and Conditions, and Actions sections are similarly laid out. Each section may contain none, one, or many subsections. Each subsection represents a individual trigger, condition, or action. You can add, move, and remove sections using the Action (cog) menu. An Action (cog) menu is provided for each section and each menu affects only its section. For detailed information about the available triggers, conditions, and actions, refer to the Power Manager: Developer guide. The complete event structure is documented including details of each field. Click on the + (plus) button next to 0 Triggers. Click on the + (plus) button next to 0 Conditions. Click on the + (plus) button next to 0 Actions. Locate the Action (cog) menu associated with the trigger. Select the menu item: Action (cog) > Delete Trigger. Locate the Action (cog) menu associated with the condition. Select the menu item: Action (cog) > Delete Condition. Locate the Action (cog) menu associated with the action. Select the menu item: Action (cog) > Delete Action. Locate the Action (cog) menu associated with the trigger, condition, or action. Select the menu item: Action (cog) > Move Up. Select the menu item: Action (cog) > Move Down. Locate the Action (cog) menu associated with the section to effect. Select the menu item: Action (cog) > Optional Field.